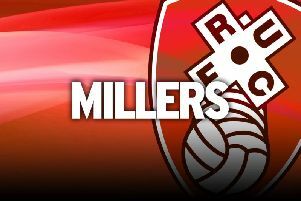 After England made set-pieces fashionable again in the World Cup this summer, Rotherham are carrying on that trend in the Championship. The Millers have been a potent threat from dead balls this season and it was their prowess in the box that earned them an important 1-0 win over Millwall. Sean Raggett might well become Rotherham's very own Harry Maguire as he got on the end of Will Vaulks' delivery in the first half and that proved to be the difference between the two sides at a rain-soaked AESSEAL New York Stadium. Aside from scoring the winner Raggett, on a season-long loan from Norwich, was a man-mountain and put his head places they had no right to be. It is no wonder that boss Paul Warne calls his defender 'Slabhead' - the same nickname that Maguire acquired for his summer exploits in Russia. Raggett's decisive moment in the opposition penalty area earned the Millers a second win of the campaign, leaving them with a respectable six points from their opening five games. And on the evidence we have seen so far, Warne's side might just be able to compete in this league if they play to their strengths. Warne has never been embarrassed about his side's ability to get the ball into the box and why would he? It is their best chance of scoring in this division and it provided them a route to 20th-minute opener. Vaulks received his quick throw-in back from Ryan Williams and then sent in a delicious delivery which was nodded in by Raggett. The goal opened the game up and the Millers continued to pose danger with deliveries into the box as Ryan Manning's free-kick just evaded Richard Wood while Semi Ajayi, celebrating his call-up to Nigeria's squad, shot into the side-netting after a recycled corner. After Marek Rodak was needed to keep out a Jake Cooper header early in the second half the Millers regained control and after Williams and Manning had fired off target their golden chance came, and it was a fine move from open play. Michael Smith's cleverly set Kyle Vassell free, who returned the ball to Smith in a glorious position, but the striker's low shot was straight at Jordan Archer. Raggett showed his ability in his own box with several important headers and blocks, but the Millers also relied on Rodak to keep out a low Tom Elliott effort. You knew it was going to be Rotherham's day when even Tom Bradshaw, fresh from his £1million move from Barnsley, could not make an impact. And in the end it was Rotherham, and Warne, who was left singing in the New York rain.